Have you ever played Scrabble or Bananagrams? Can you imagine versions of these games that would use numbers instead of letters? 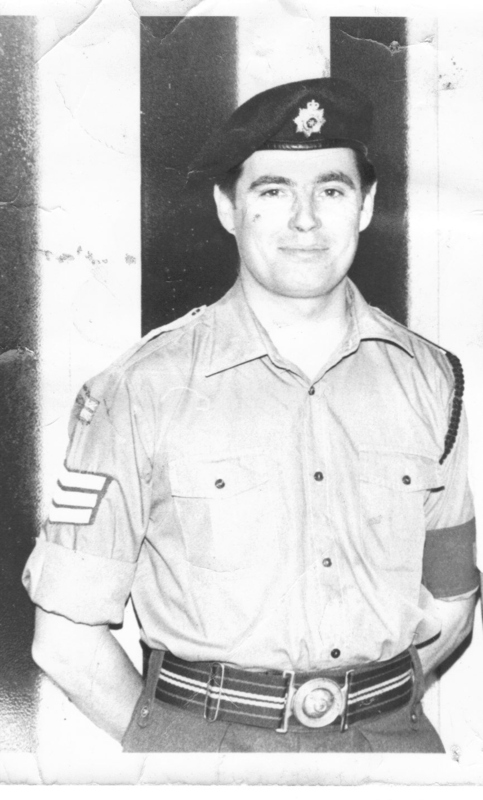 Meet Tom Lennett, who imagined them and then made them! 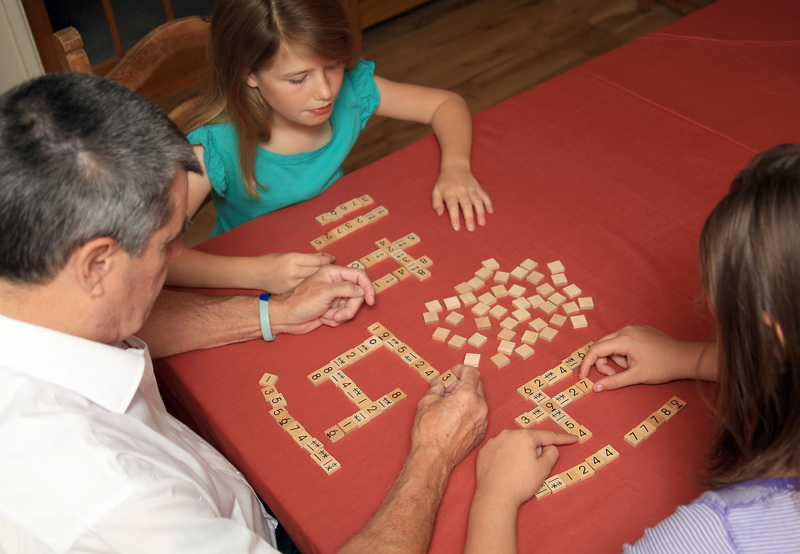 Tom playing Numenko with his grandkids. Numemko is a crossnumber game. 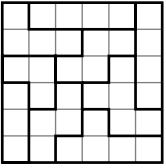 Players build up number sentences, like 4×3+8=20, that cross each other like in a crossword puzzle. There is both a board game version of Numenko (like Scrabble) and a bag game version (like Banagrams). Tom invented the board game years ago to help his daughter get over her fear of math. He more recently invented the bag game for his grandkids because they wanted a game to play where they didn’t have to wait their turn! One important feature of Numenko is the Multichoice tile. 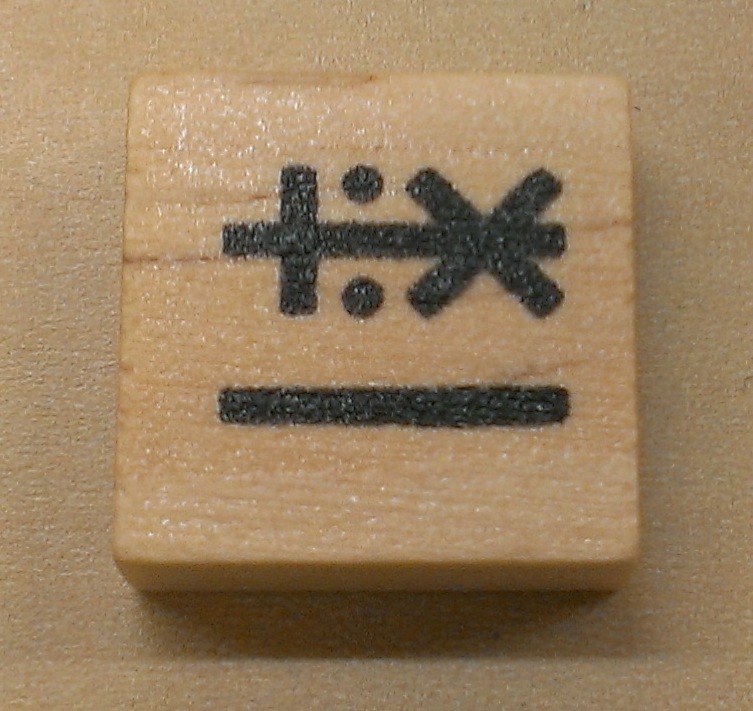 Can you see how it can represent addition, subtraction, multiplication, division, or equality? How would you like to have a Numenko set of your own? Well, guess what—Tom holds weekly Numenko puzzle competitions with prizes! You can see the current puzzle on this page, as well as the rules. Here’s the puzzle at the time of this post—the week of November 3, 2013. Challenge: replace the Multichoice tiles to create a true number sentence. I can assure you that it’s possible to win Tom’s competitions, because one of my students and I won Competition 3! I played my first games of Numenko today and really enjoyed them. I also tried making some Numenko puzzles of my own; see the sheet at the bottom of this post to see some of them. In emailing with Tom I’ve found that he’s had a really interesting life. He grew up in Scotland and left school before he turned 15. He’s been a football-stitcher, a barber, a soldier, a distribution manager, a paintball site operator, a horticulturist, a property developer, and more. And, of course, also a game developer! Do you have a question you’d like to ask Tom? Send it in through the form below, and we’ll try to include it in our upcoming Q&A! Say, do you like Bloxorz? I sure do—it’s one of my favorite games! So imagine my delight when I discovered that a fan of the game—who goes by the handle Jz Pan—created an extension of it where you can make your own levels. Awesome, right? It’s called Turning Square, and you can download it here. But wait, there’s more! Turning Square also introduces new elements to Bloxorz, like slippery ice and pyramids you can trip over. 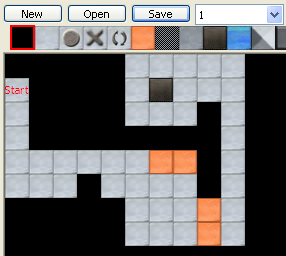 It has a random level generator that can challenge you with different levels of difficulty. Finally, Turning Square includes a level solver—it can determine whether a level that you create is possible or not and how many steps it takes to complete. Jz Pan is from China and is now a graduate student at the Chinese Academy of Sciences, majoring in mathematics and studying number theory. Jz Pan made Turning Square in high school, back in 2008. Jz Pan has agreed to answer some of your questions! Use the form below to send us some. If you make a level in Turning Square that you really like, email us the .box file and we can share it with everyone through our new Readers’ Gallery! Here is my level from above, if you want to try it out. Jz Pan has also worked on an even more ambitious extension of Bloxorz called Turning Polyhedron. 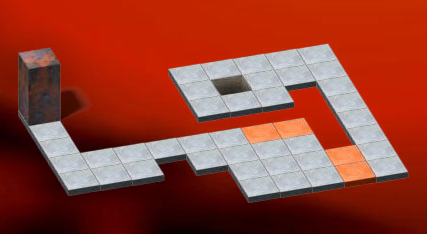 The goal is the same, but like the game Dublox, the shape that you maneuver around is different. 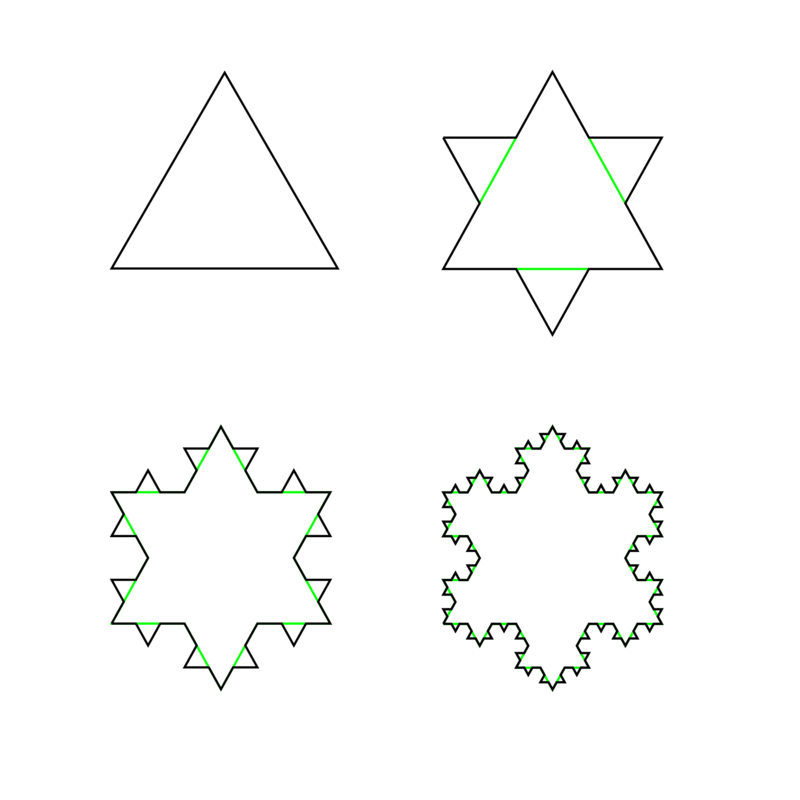 Turning Polyhderon features several different shapes. Check out this video of it being played with a u-polyhedron! And if you think that’s wild, check out this video with multiple moving blocks! Last up this week, have you ever heard that it’s impossible to fold a piece of paper in half more than eight times? Or maybe it’s seven…? Either way, it’s a “fact” that seems to be common knowledge, and it sure seems like it’s true when you try to fold up a standard sheet of paper—or even a jumbo sheet of paper. The stack sure gets thick quickly! Britney and her 11th fold. Well, here’s a great story about a teenager who decided to debunk this “fact” with the help of some math and some VERY big rolls of toilet paper. Her name is Britney Gallivan. Back in 2001, when she was a junior in high school, Britney figured out a formula for how much paper she’d need in order to fold it in half twelve times. Then she got that amount of paper and actually did it! Due to her work, Britney has a citation in MathWorld’s article on folding and even her own Wikipedia article. After high school, Britney went on to UC Berkeley where she majored in Environmental Science. I’m trying to get in touch with Britney for an interview—if you have a question for her, hold onto it, and I’ll keep you posted! EDIT: I got in touch with Britney, and she’s going to do an interview! A diagram that illustrates how Britney derived her equation. The best place to read more about Britney’s story in this article at pomonahistorical.org—the historical website of Britney’s hometown. Britney’s story shows that even when everyone else says that something’s impossible, that doesn’t mean you can’t be the one to do it. Awesome. I hope you enjoy trying some Numenko puzzles, tinkering with Turning Square, and reading about Britney’s toilet paper adventure. PS Want to see a video of some toilet-paper folding? Check out the very first “family math” video by Mike Lawler and his kids. Welcome to this week’s Math Munch… on (approximately) Math Munch’s second birthday! Hooray! Cool, right? This piece is called “Beautiful Chaos.” The curves on the screen are made from equations (if you’ve ever graphed a line or a parabola you’ll know what I mean). As the viewer waves her hands around, the equations change– and as the equations change, so do the curves! The result is something that might remind you of the images your computer makes when you play music on it or maybe of something you’d make using a spirograph. All in all, a beautiful and interactive piece of mathematical art. My school is really lucky to be hosting Nathan this week! We didn’t want any of you, dear readers, to miss out on the excitement, though– so Nathan has kindly agreed to answer your interview questions! Got a question for Nathan? Write it in the box below. He’ll answer seven of your best questions in two weeks! Next up, who doesn’t love to play Mastermind? It’s a great combination of logic, patterns, and trickery… but I just hate having to use all those tiny pegs. Well, guess what? You can play it online— no pegs (or opponent) necessary! Well, it turns out there is a God’s Number for Mastermind – and that number is five. Just five. If you played perfectly and followed the strategy demonstrated by recreational mathematician Toby Nelson on his website, you could guess ANY Mastermind code in five guesses or less. Toby shares many more interesting questions about Mastermind on his website— I suggest you check it out. What ARE those irrational numbers, so weird that they get their own bubble?? Finally, sometime in your mathematical past you may have heard of irrational numbers. These are numbers like the square-root of 2 or pi or e that can’t be written as a fraction– or so people claim. When you start thinking about this claim, however, it may seem strange. There are A LOT of fractions– and none of them equal the square-root of 2? Really? What kind of number is that? It seems like only an irrational person would believe that, at least without proof. Vi Hart to the rescue! Irrational numbers were encountered long, long ago by the ancient Greek mathematician (and cult leader) Pythagoras– and he didn’t like them much. In this great video, Vi tells all about Pythagoras and the controversial discovery of numbers that aren’t fractions. If you didn’t follow her explanation of why the square-root of 2 is irrational on your first watch, don’t worry– it’s a complicated idea that’s worth a second (or third or fourth) run-through. Thanks for a great two years of Math Munch! Bon appetit! Welcome to this week’s Math Munch! This week, I’m sharing with you some math things that make me go, “What? !” Maybe you’ll find them surprising, too. The first time I heard about this I didn’t believe it. If you’ve never heard it, you probably won’t believe it either. Ever tried to solve one of these? I’ve only solved a Rubik’s cube once or twice, always with lots of help – but every time I’ve worked on one, it’s taken FOREVER to make any progress. Lots of time, lots of moves…. There are 43,252,003,274,489,856,000 (yes, that’s 43 quintillion) different configurations of a Rubik’s cube, so solving a cube from any one of these states must take a ridiculous number of moves. Right? Nope. In 2010, some mathematicians and computer scientists proved that every single Rubik’s cube – no matter how it’s mixed up – can be solved in at most 20 moves. Because only an all-knowing being could figure out how to solve any Rubik’s cube in 20 moves or less, the mathematicians called this number God’s Number. Once you get over the disbelief that any of the 43 quintillion cube configurations can be solved in less than 20 moves, you may start to wonder how someone proved that. Maybe the mathematicians found a really clever way that didn’t involve solving every cube? Here’s a chart that shows how many Rubik’s cube configurations need different numbers of moves to solve. I think it’s surprising that so few required all 20 moves. Even though every cube can be solved in 20 or less moves, this is very hard to do. I think it’s interesting how in the video, one of the people interviewed points out that solving a cube in very few moves is probably much more impressive than solving a cube in very little time. 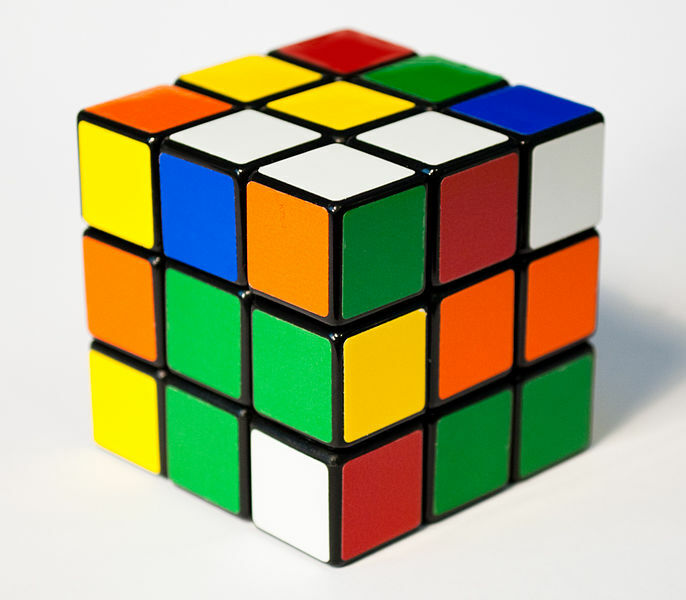 Just think – it takes so much thought to figure out how to solve a Rubik’s cube at all. If you also tried to solve it efficiently… that would really be a puzzle. This type of puzzle, where area seems to magically appear or disappear when it shouldn’t, is called a geometric vanish. We’ve been talking about these a lot at school, and one of the things we’re wondering is whether you can do what the guy in the video did again, to make a second magical square of chocolate. What do you think? Finally, I’ve always found infinity baffling. It’s so hard to think about. Here’s a particularly baffling question: which is bigger, infinity or infinity plus one? Is there something bigger than infinity? I found this great story that helps me think about different sizes of infinity. It’s based on similar story by mathematician Raymond Smullyan. In the story, you are trapped by the devil until you guess the devil’s number. The story tells you how to guarantee that you’ll guess the devil’s number depending on what sets of numbers the devil chooses from. Is there something mathematical that makes you go, “What? !” How about, “HUH? !” If so, send us an email or leave us a note in the comments. We’d love to hear about it! Justin proceeded to show me that I wasn’t alone in discovering pentominoes – or any of their cousins, the polyominoes, made of any number of squares. I spent four happy years learning lots of things about polyominoes. Until one day… one of my students asked an unexpected question. Why squares? What if we used triangles? Or hexagons? A square made with all polyominoes up to heptominoes (seven), involving as many internal squares as possible. … I found the Poly Pages. This is the polyform site to end all polyform sites. You’ll find information about all kinds of polyforms — whether it be a run-of-the-mill polyomino or an exotic polybolo — on this site. Want to know how many polyominoes have a perimeter of 14? You can find the answer here. Were you wondering if polyominoes made from half-squares are interesting? Read all about polyares. I’m so excited to have found this site. Even though I have to share credit for my discovery with other people, now I can use my new knowledge to ask even more interesting questions. Next up, check out this clock arithmetic calculator. This calculator does addition, subtraction, multiplication, and division, and even more exotic things like square roots, on a clock. What does that mean? Well, a clock only uses the whole numbers 1 through 12. Saying “15 o’clock” doesn’t make a lot of sense (unless you use military time) – but you can figure out what time “15 o’clock” is by determining how much more 15 is than 12. 15 o’clock is 3 hours after 12 – so 15 o’clock is actually 3 o’clock. You can use a similar process to figure out the value of any positive or negative counting number on a 12 clock, or on a clock of any size. This process (called modular arithmetic) can get a bit time consuming (pun time!) – so, give this clock calculator a try! Finally, here is some wonderful mathemusic by composer Tom Johnson. Tom writes music with underlying mathematics. In this piece (which is almost a dance as well as a piece of music), Tom explores the possible paths between nine bells, hung in a three-by-three square. I think this is an example of mathematical art at its best – it’s interesting both mathematically and artistically. Observe him traveling all of the different paths while listening to the way he uses rhythm and pauses between the phrases to shape the music. Enjoy! Thank you so much to everyone who participated in our Math Munch “share campaign” over the past two weeks. Over 200 shares were reported and we know that even more sharing happened “under the radar”. Thanks for being our partners in sharing great math experiences and curating the mathematical internet. Of course, we know that the sharing will continue, even without a “campaign”. Thanks for that, too. All right, time to share some math. On to the post! In contrast, doing math was entirely different. After trying it for a while, I realized that I could take my time, try alternative beginnings, do one step after another, and get to glimpse all kinds of possibilities along the way. I hope the math munches I share with you this week will help you to “glimpse all kinds of possibilities,” too! Recently I went to the Museum of Modern Art (MoMA) in New York City. (Warning: don’t confuse MoMA with MoMath!) On display was an exhibit called Abstract Generation. You can view the pieces of art in the exhibit online. 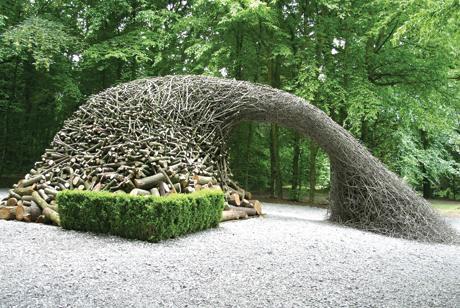 Just looking at them, these sculptures are definitely cool. However, they become even cooler when you realize that they are pop-up sculptures! Can you see how the platforms that the sculptures sit on are actually the covers of a book? Neat! Here’s a video that showcases all of Tauba’s pop-ups in their unfolding glory. Why do you think this series of sculptures is called [2,3]? This idea of pop-up book math intrigued me, so I started searching around for some more examples. Below you’ll find a video that shows off some incredible geometric pop-ups in action. To see how you can make a pop-up sculpture of your own, check out this how-to video. Both of these videos were created by paper engineer Peter Dahmen. Tauba got me thinking about math and pop-up books, but there’s even more to see and enjoy on her website! Tauba’s art gives me new ways to connect with and reimagine familiar structures. Remember our post about the six dimensions of color? Tauba created a book that’s a color space atlas! The way that Tauba plays with words in these pieces reminds me both of the word art of Scott Kim and the word puzzles of Douglas Hofstadter. Some of Tauba’s ink-on-paper designs remind me of the work of Chloé Worthington. And Tauba’s piece Componants, Numbers gives me some new insight into Brandon Todd Wilson’s numbers project. This piece by Tauba is a Math Munch fave! For me, both math and art are all about playing with patterns, images, structures, and ideas. Maybe that’s why math and art make such a great combo—because they “play” well together! Speaking of playing, I’d like to wrap up this week’s post by sharing a game about numbers I ran across recently. It’s called . . . A Game of Numbers! I really like how it combines the structure of arithmetic operations with the strategy of an escape game. A Game of Numbers was designed by a software developer named Joseph Michels for a “rapid” game competition called Ludum Dare. Here’s a Q&A Joseph did about the game. If you enjoy A Game of Numbers, maybe you’ll leave Joseph a comment on his post about the game’s release or drop him an email. And if you enjoy A Game of Numbers, then you’d probably enjoy checking out some of the other games on our games page. PS Tauba also created a musical instrument called an auerglass that requires two people to play. Whooooooa! Ah, summertime. 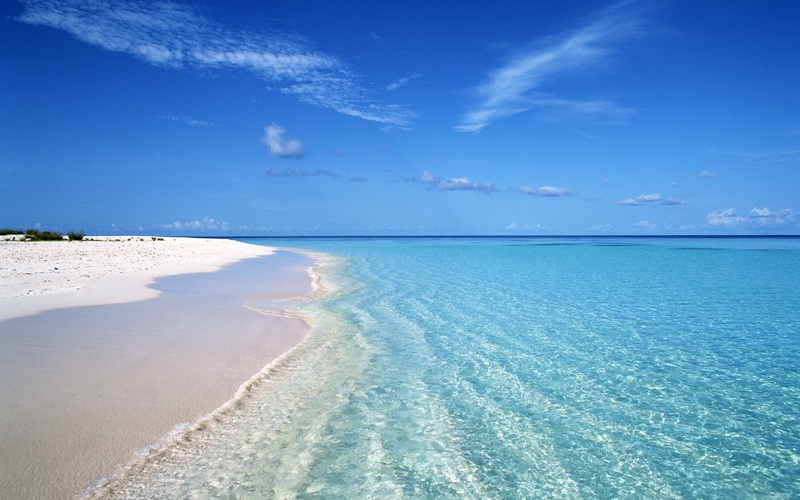 If it’s as hot where you are as it is here in New York, I bet this beach looks great to you, too. A huge expanse of beach all to myself sounds wonderful… And that makes me wonder – how much coastline is there in the whole world? Interestingly, the length of the world’s coastline is very much up for debate. Just check out this Wikipedia page on coastlines, and you’ll notice that while the CIA calculates the total coastline of the world to be 356,000 kilometers, the World Resources Institute measures it to be 1,634,701! What??? As Vertitasium says, many coastlines are fractals, like the Koch snowflake shown at left – never-ending, infinitely complex patterns that are created by repeating a simple process over and over again. In this case, that simple process is the waves crashing against the shore and wearing away the sand and rock. If coastlines can be infinitely long when you measure them with the tiniest of rulers, how to geographers measure coastline? By choosing a unit of measurement, making some approximations, and deciding what is worth ignoring! And, sometimes, agreeing to disagree. Need something to read at the beach, and maybe something puzzle-y to ponder? Check out this interesting article by four mathematicians and computer scientists, including James Henle, a professor in Massachusetts. They’ve invented a Sudoku-like puzzle they call a “Clueless Puzzle,” because, unlike Sudoku, their puzzle never gives any number clues. How does this work? These puzzles use shapes instead of numbers to provide clues. Here’s an example from the paper: Place the numbers 1 through 6 in the cells of the figure at right so that no digit appears more than once in a row or column AND so that the numbers in each region add to the same sum. The paper not only walks you through the solution to this problem, but also talks about how the mathematicians came up with the idea for the puzzles and studied them mathematically. It’s very interesting – I recommend you read it! 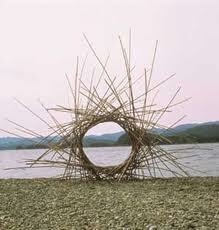 Or make one of these! Happy summer, and bon appetit! It has been a thrilling last month in the world of mathematics. Several new proofs about number patterns have been announced. Just to get a flavor for what it’s all about, here are some examples. People have been wondering about these questions for hundreds of years. Last month, Harald Helfgott showed that the Weak Goldbach Conjecture is true! And Yitang “Tom” Zhang showed that there are infinitely many prime pairs that are at most 70,000,000 apart! You can find lots of details about these discoveries and links to even more in this roundup by Evelyn Lamb. What’s been particularly fabulous about Tom’s result about gaps between primes is that other mathematicians have started to work together to make it even better. Tom originally showed that there are an infinite number of prime pairs that are at most 70,000,000 apart. Not nearly as cute as being just two apart—but as has been remarked, 70,000,000 is a lot closer to two than it is to infinity! That gap of 70,000,000 has slowly been getting smaller as mathematicians have made improvements to Tom’s argument. You can see the results of their efforts on the polymath project. As of this writing, they’ve got the gap size narrowed down to 12,006—you can track the decreasing values down the page in the H column. So there are infinitely many pairs of primes that are at most 12,006 apart! What amazing progress! Two names that you’ll see in the list of contributors to the effort are Andrew Sutherland and Scott Morrison. Andrew is a computational number theorist at MIT and Scott has done research in knot theory and is at the Australian National University. They’ve improved arguments and sharpened figures to lower the prime gap value H. They’ve contributed by doing things like using a hybrid Schinzel/greedy (or “greedy-greedy”) sieve. Well, I know what a sieve is and what a greedy algorithm is, but believe me, this is very complicated stuff that’s way over my head. Even so, I love getting to watch the way that these mathematicians bounce ideas off each other, like on this thread. I can think of only two times in my life where I was so captivated by mathematics in the making as I am by this prime gaps adventure. Andrew Wiles’s proof of Fermat’s Last Theorem was on the fringe of my awareness when it came out in 1993—its twentieth anniversary of his proof just happened, in fact. The result still felt very new and exciting when I read Fermat’s Enigma a couple of years later. Grigori Perelman’s proof of the Poincare Conjecture made headlines just after I moved to New York City seven years ago. I still remember reading a big article about it in the New York Times, complete with a picture of a rabbit with a grid on it. This work on prime gaps is even more exciting to me than those, I think. Maybe it’s partly because I have more mathematical experience now, but I think it’s mostly because lots of people are helping the story to unfold and we can watch it happen! Next up, I ran across a great site the other week when I was researching the idea of a “cut and slide” process. The site is called Mad Maths and the page I landed on was all about beautiful dissections of simple shapes, like circles and squares. I’ve picked out one that I find especially charming to feature here, but you might enjoy seeing them all. The site also contains all kinds of neat puzzles and problems to try out. I’m always a fan of congruent pieces problems, and these paper-folding puzzles are really tricky and original. (Or maybe, origaminal!) You’ll might especially like them if you liked Folds. Christian’s applet displaying the original four-room castle. Finally, we previously posted about Matt Parker’s great video problem about a princess hiding in a castle. Well, Christian Perfect of The Aperiodical has created an applet that will allow you to explore this problem—plus, it’ll let you build and try out other castles for the princess to hide in. Super cool! Will I ever be able to find the princess in this crazy star castle I designed?! And as summer gets into full swing, the other kind of castle that’s on my mind is the sandcastle. Take a peek at these photos of geometric sandcastles by Calvin Seibert. What shapes can you find? Maybe Calvin’s creations will inspire your next beach creation!